Conventions keep you on your feet and busy for long periods of time, sometimes a lot longer than you’re used to. It’s important to make sure you eat and stay hydrated! Snack mixes are great to eat to give you a boost until your next meal time, and they don’t make a mess on your fingers while you play the games! 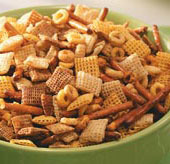 This is a more traditional, healthy snack mix that you can put into plastic bags and tuck into your bag at the convention. Let us know if you make this recipe! In a small bowl, combine Olive Oil, Worcestershire Sauce, Seasoned Salt and Garlic Powder. Pour olive oil mixture over cereal mixture and toss to coat. Spread mix to two 15-in. x 10-in. x 1-in. baking pans coated with cooking spray. Cool completely on wire cooling racks and store in airtight container.